ADF Faces uses the standard JSF messaging API. JSF supports a built-in framework for messaging by allowing FacesMessage instances to be added to the FacesContext object using the addMessage(java.lang.String clientId, FacesMessage message) method. In general there are two types of messages that can be created:component-level messages, which are associated with a specific component based on any client ID that was passed to the addMessage method, and global-level messages, which are not associated with a component because no client ID was passed to the addMessage method. 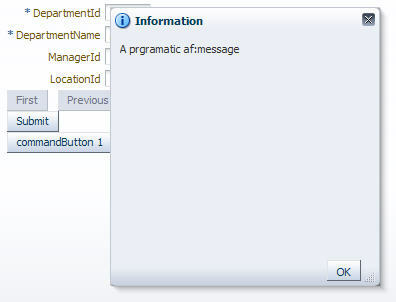 in this post, I will show how to show af:message programatically. * set the type of the message. the code above will show the message in pop-up dialog as shown below. However, you can show the global message inline with the page, what you want to do is to change the inline attribute of the af:messages in your page, this component is created automatically for you when you create a page. The inline attribute controls whether to render the message list inline with the page or in a popup window, the default value is false. Normally the messages are rendered in a pop up. If this attribute is set to true, the messages list will be rendered inline with the page. To find the af:messages, open your page in the main window, from the structure window you can find it under f:view,af:document nodes. Your global message will be shown inline with page as shown below. //departmentName is the binding property for our field. In the previous post, I have shown how to control the row updatability based on some conditions. 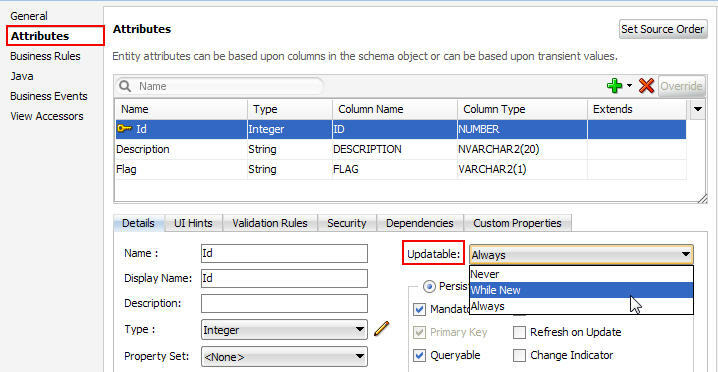 Another popular use case for row updatability is making the row or some attributes within the row only updatable while the row status is new, but after being successfully committed to the database they should become read-only. In this post I will show how to implement this use case in declarative and programmatic ways. The Updatable property controls that is available for each attribute within the entity and view objects has a While New option, we can set this property for single, multiple, or all attributes as shown below. * ID is the attributeEnum. see also: Control row updatability – part 1. 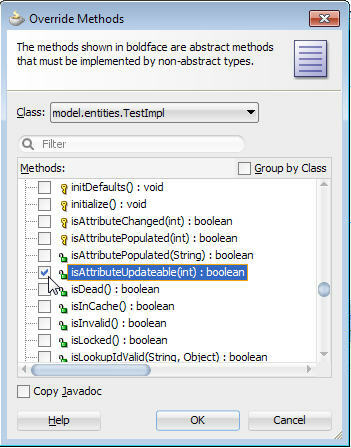 Sometimes developers want to make an entire row as read only based on some conditions, As an example assume that you have an application that allows users to apply for something, once the application is approved they are not allowed to modify any attribute instead they can only see their application, this can be done by setting the read only property for each attribute from the property inspector. However, doing this is a headache approach especially if you want to repeat this in many pages and your row contains many attributes. To implement such similar case in effective approach, we can override the isAttributeUpdateable method either in the EntityImpl class or in the ViewRowImpl class. If you want your row to be non updatable regardless of the view object being used, then override the isAttributeUpdateable method in the EntityImpl class otherwise override the method in your ViewRowImpl class. The steps required to do this are, (assumed we need to override the isAttributeUpdateable method in EntityImpl class). generate your custom EntityImpl class. Assumed that your EntityImpl class is opened in Jdeveloper main window, click on the source menu, then select Override methods as shown below. 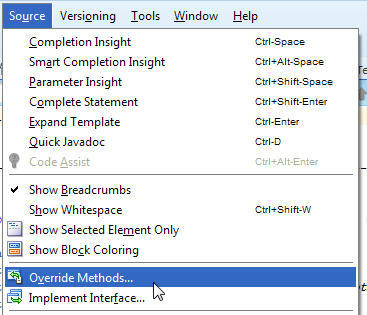 The Override methods window will open, select the isAttributeUpdateable method and click OK as shown below. see also: Control row updatability – part 2. When we add a new row in af:table,the default behavior is that the new row is added before the current row. Sometimes we may need to change this behavior. In this post I will show how we can add new row at different locations within our table, and automatically scrolling to that new row. This post is based on hr schema (EMPLOYEES table) and assumed that you have already built your BC. 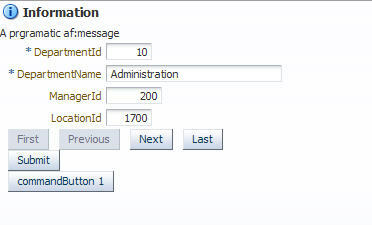 The button used to add a new row has its PartialSubmit property set to true, and the table has its PartialTrigger property references the button’s id, also our table should have its DisplayRow property set to selected, the table binding in the managed bean is empTable (setEmpTable(RichTable empTable), getEmpTable()).